When I first heard the name “Between You And Me: Flight To Societal Moksha”, I believed it to be some sort of romantic novel. Then I went through the blurb of the book and was completely surprised to learn about the nature of its contents. This was especially so because I am not too keen about reviewing non-fictional books especially those that are focused on politics and governance. However, despite my reluctance, I decided to review this book penned by Atul Khanna, which deal with an extremely important topic. The book discusses the fact that the modern governmental systems and policies are mostly outdated with respect to the needs of the current times. The author has presented a holistic view of the Indian state and the issues faced by its citizens with respect to the government, economy, education, health care, and other sectors. The book makes the readers ponder about the various challenges that we are currently facing and the need to bring about social and political changes to overcome the same. It also reminds the readers as to how the development and implementation of fresh ideas and perspectives will benefit the nation. I started reading the book with much skepticism, but as I progressed with my reading I became gradually impressed. The conversational tone of the book made for easy reading. In addition, the fact that the author had carried out extensive research before compiling the content also makes the book truly a great read. This is evident from the extensive discussions and analysis on which the author has based his knowledge of the most important aspect of Indian society. 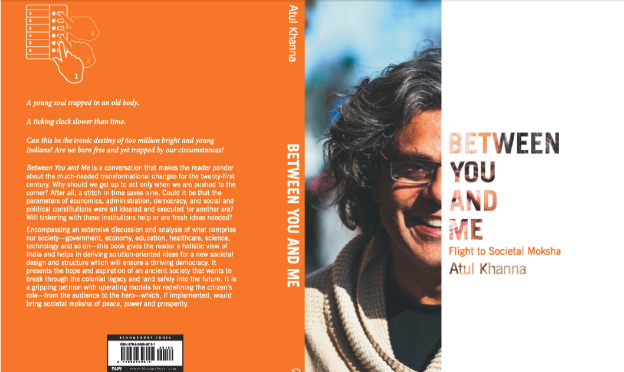 Overall, I consider Between You And Me to be a great addition to my collection and wish the brilliant writer Atul Khanna all the very best for the success of this book.